You are here: Home » Reviews » My Norwex Journey–The First Look » My Norwex Journey–We’re In! As you may have read from our previous post, Cathy and I were so impressed with our initial Norwex trial, we dove in deeper. Not only did we decide to further safeguard our home using Norwex products, we also decided to become consultants to spread the word. We ordered our consultant kit for $9.99 and got a TON of stuff! Oh my, were we excited! We’ve unpackaged and used every piece of Norwex that we have received and we LOVE it all! Our Facebook launch party is ending today, so we’re really trying to get the word out. You REALLY need to see this stuff. Don’t just take my word for it. There are testimonials of people out there–Norwex has changed their lives. A friend of mine has cleared up her skin conditions just from using Norwex products instead of chemical cleansers. Another colleague of mine uses the makeup removal cloth to remove her heavy theater and clown makeup–with just water! While the Norwex Bag and paperwork are nice and necessary to function as a consultant, I wanted to focus briefly on why we love the products that came to us. We will continue to receive products and let you know what we think of them (one shipment is coming today!!). Later on, I’ll go in-depth with each product to give you an even clearer picture. This is a fantastic piece of work. This cloth has enough microfiber in it to stretch from Canada to Mexico! What does this mean for you? 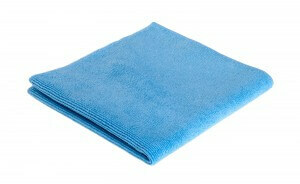 It means it is strong, it is absorbent, and it far surpasses the standards of microfiber. It has BacLock technology in it that makes it almost self-cleaning. Bacteria, fungus, and mold will not grow on this cloth due to the silver-infused into the microfiber. How we used it the first day: We first cleaned the bathroom sink with just water (and we let it get pretty dirty). Then we cleaned off the kitchen counters. After that, we cleaned our mirror over our bathroom sink and the long mirror on our bathroom door. With the other one, we showed our 13-year old (who cleans only when she absolutely has to) how to use the cloth. Later on, we went to “her” bathroom and she had cleaned it–WITHOUT BEING ASKED! If it can make a self-proclaimed lazy teenager want to clean, then I think it’s worth its weight in gold (and it can hold 7-times its weight)! All surfaces were left spotless. We followed up the smooth surfaces with the window cloth. This has a real silky feel to it. It’s pretty sturdy compared to how I thought it would feel. It also has the BacLock technology in it. The one we got was a pretty shade of purple. That doesn’t really matter much to me, but it makes it easier to tell the difference in the cloths at first glance. How we used it the first day: We followed up what we did with the Envirocloth with the window cloth. I have to say, our mirrors haven’t looked that good since we moved into the house! And it was fantastic not having to smell that ammonia that we find in many window cleaning solutions. The appliances gained a shine that made them look brand new! Best of all, we just used the window cloth dry! That’s right, no solution needed at all. And with the BacLock technology, I know that it disinfected the surfaces as well. This is the recommended laundry detergent solution not only for your Norwex cloths but also everyday laundry (you can use normal detergent for Norwex cloths. It just has to have no bleach and no fabric softener). It contains no phosphates, chlorine, dyes, fragrances, or anything else that could irritate our skin and health. It’s highly concentrated so that you get a lot of use out of one container. How we used it the first day: We basically used this at first to clean all of our Norwex cloths. But we did put in some sheets and “non-fuzzy” clothes to fill out the load a little. The clothes came out without any scent (which will maybe deter some from using this product). However, you can use essential oils on the Fluff and Tumble Dryer Balls if you desire your clothes to be scented. You’ll get the same effect, but without all the chemicals and dyes. This came at just the right time. I’ve been dealing with allergies and developed a bit of a respiratory issue over the past few weeks. This thing works without any sprays or solutions. Just put the mitt on your hand and wipe the dust off anywhere you touch. The fibers trap in the dust (instead of spreading it) and leave no residue that attracts more dust–meaning you dust less often). How we used it the first day: Cathy went crazy in our bedroom! She dusted the dressers, the TV, the blinds, the lamp shades, the door frames–and that was just the bedroom! She loved how easy it made everything. She was even able to dust the grooves in the air vent without much effort. This also contains BacLock! This comes in lots of packages. The one that came with the kit is the Superior Mop Collection. It came with a telescoping handle, mop base, a large superior dry mop pad, and a large superior wet mop pad. The pads attach to the base with velcro and are both machine-washable. Both also contain BacLock. How we used it the first day: We attached the dry mop base and went over not only floors, but walls, tops of the door frames, cobwebs on the ceiling, and whatever else we couldn’t reach. I’d love to get the attachment that allows you to use an EnviroCloth and/or Window Cloth for more targeted cleaning. Then we followed it up with the wet mop pad. We simply got the whole pad wet, wrung out the water, and mopped as usual. the floor ended up shiny, free from residue, and most importantly, clean! Our next purchase (that we’re getting today!) 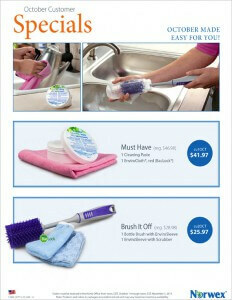 is the rubber brush so that we can clean the debris off of the dry mop pad after use. FANTASTIC! I can’t wait to clean again. We’re going to tackle the kitchen stove with the EnviroCloth next. Maybe we’ll video it to show you the before and after real-time! I truly believe that homes across the world can benefit from all these things. Become a Consultant and spread the word! We have a drawing pending right now. You can benefit for free. One entry into the drawing for liking us on Facebook (once we hit 100 likes). Five Ten Entries for making a purchase of $10 or more. Ten Twenty Entires for becoming a consultant! Hey Raphael, a very nice review you got here! I was particularly interested in the Envirocloth, no idea it can hold so much weight. It seems very versatile too. Do you recommend it for car cleaning? I was thinking of getting it or the entire kit for my father to clean his car lol. Thank you for your comment, Gin. The Envirocloth is amazing! We have two, and I think we’re going to order a few more. For car cleaning, it could work. There are car cloths, though. They are specifically designed to not scratch the vehicle. I would recommend them for cars:) They work like the Envirocloth and window cloth do inside. Car Wash Mitt and Car Cloth. We have a secondary launch party going on through Thursday if you want to place an order:) It would help us meet our fast start goal! Thank you for your review of Norwex. They sound like a great alternative to the harsh chemical used in many cleaning products you get at the supermarket. I like easy clean up. I do have a couple questions: What is BacLock technology? I have never heard of that. Also, is Norwex an MLM campaign as well? You mention becoming consultants so I was wondering? Thanks for your comment, Stephanie. BacLock technology is basically their use of silver in the microfiber. Silver acts as a bacteria growth inhibitor (and also fungus, and mold). Because of how it’s woven into some of their products, those germs don’t grow in the cloths! This keeps them from getting slimy, stinky, or anything else you associate with microbe growth. Also, Norwex is a direct sales company like Avon, 31, Melaluca, Pampered Chef, or any of those places. It truly is a great company! Hey guys, thanks for writing these reviews of the norwex products. 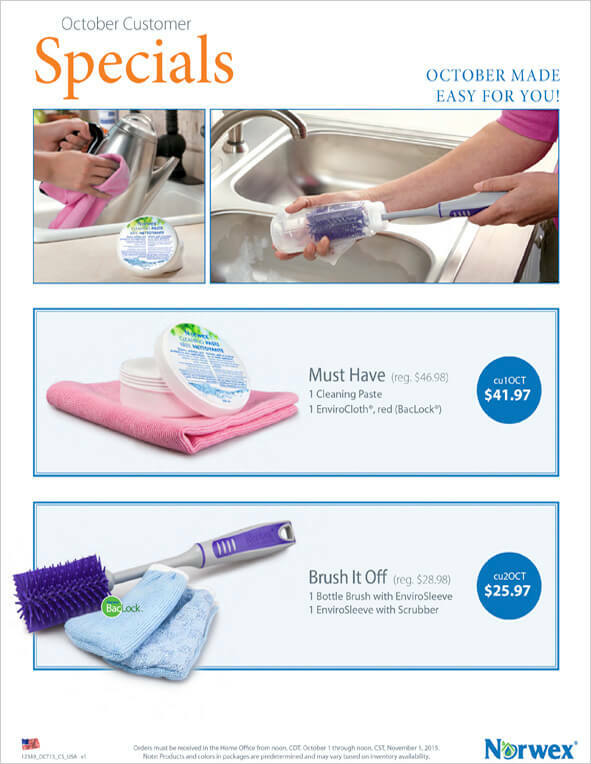 We are constantly on the lookout for new stuff to keep our house cleaner. One big problem that we have is that one of the members of our household is a shepherd/lab mix we rescued five years ago. We love her to death but she has that thick shepherd fur and when her seasonal coats are coming in her shedding is brutal. Are these products good for picking up a lot of dog hair? And I mean A LOT! Thank you for your comment, Christian. We have dogs, too. However, I don’t think our shed as much as yours do! For pets, I know that there are a few products that could work. There is the rubber brush that helps get hair and lint from many fabric/carpet surfaces. What’s really nice is that it can clean the mop pads and all that as well. The dusting mitt really helps get hair off of hard surfaces with ease. And there is something else that you may or may not be interested in. There is a natural carpet stain buster that can help for when your pet (or little ones!) leave an unexpected mess. The thing I love about the dusting mitt is that it is two-sided. You can clean with either side. When it gets full, use the rubber brush on it to remove excess hair, then continue cleaning 🙂 We get our rubber brush maybe tomorrow. I’ll do another post about how that works for me. Thanks again!